Obviously I should have posted on Halloween. But think positively, if you find Halloween Oreos at the store now you know they will be on sale. And candy corn usually hangs around until Thanksgiving. Earlier this year I made Thin Mint Mini Cheesecakes. So I was on board with another round for Halloween. This time the recipe came from Gingerbread Bagels. I can already see a possibility of doing these again with the Christmas or Mint Oreos down the road. I followed the recipe on Gingerbread Bagels except I used reduced fat cream cheese, and when I didn't have quite enough sour cream I used plain non-fat yogurt to make up the difference. Maybe next time I will go crazy and go for full fat all around! Small victory - we had a little Halloween sweet treat contest at work on Monday and I won a grocery gift card for my effort. 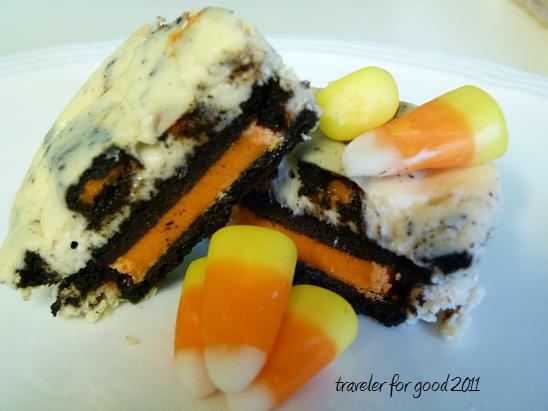 I garnished these with a small piece of Halloween Bark. Now, I just need to get a copy of the winning recipe. It was almost a pumpkin cobbler. Delicious.